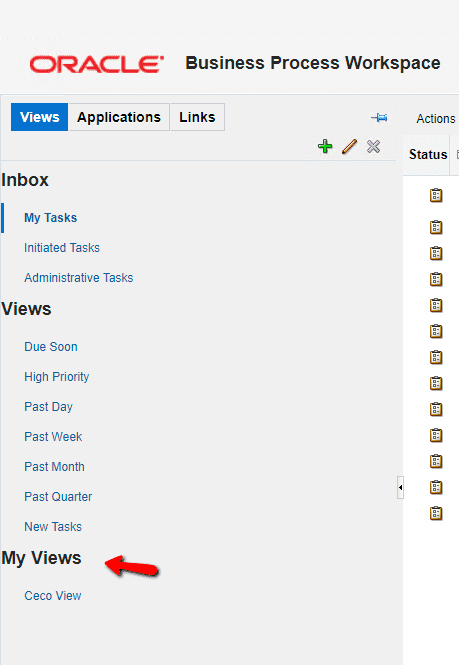 Those are the custom views you can create to allow better filtering of tasks in a workspace. What we wanted was each user working on our application to have the personal views they created available on the migrated version (12c) without needing to re-create them by their own. At first, I started with searching for a method to migrate all views for all users. This appeared to be possible, but after testing it, it did not work for me. What worked though was migrating all views for a specific user and since we had no more than 20 users needing this, it was an acceptable solution. Each row in the result contains definition for a single view (containing fields like user, view name, view owner, description, creation date… etc). For example you can group by user to see how many views each user has. Some might ask why not just copy the content of this table to the new environment and be done with this, instead of doing this more complicated process for the migration. The problem is that there are foreign keys in WFUSERTASKVIEW to other tables which prevents us from using that method. 4. Execute ant script which exports the views (using the configuration provided in the migration.properties file). This creates 2 new files containing the exported information – AttributesMapper.xml and Attributes.xml. Those files will later be used to import the views on the new environment. You can modify the parameters to suit your needs. Here is documentation from Oracle which explains each attribute from the mentioned above. You can check the Oracle documentation linked above for more information on the parameters of the ant script. After executing the script, the following 2 files will be created in the location specified on its parameters: Attributes.xml and AttributesMapper.xml. The Attributes.xml file contains the xml definition of the exported views. Please check carefully after executing the ant script that this file is populated with the appropriate information and the export was successful. AttributesMapper.xml contains the description of the operations you chose to perform using the migration properties file. You can check the ant file of course (ant-t2p-worklist.xml) to make sure you are setting the directories correctly. Now we are ready and after executing the ant script, all views for the specified user in the migration.properties file should be imported to the new environment. We need to do this whole procedure for every user for which we need view migration… After getting used to the process it will take around a minute or two to finish with one user, but it is still tedious work. Let me know if you have success with this or even better – find a way to migrate all views for all users at the same time! I will appreciate if you leave a comment to share your opinion and experience on the topic.